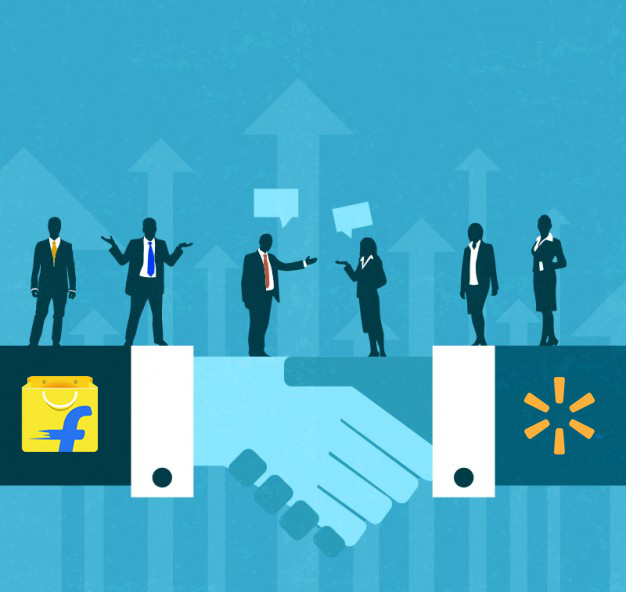 American retail giant Walmart has acquired Indian eCommerce major Flipkart in what is the world’s largest ever ecommerce deal. Walmart has paid $16 billion for about 77 per cent stake in the Bengaluru-based Flipkart. The huge deal is being billed to shake up the most thriving and exciting eCommerce markets in the globe. “The investment will help accelerate Flipkart’s customer-focused mission to transform commerce in India through technology and underscores Walmart’s commitment to sustained job creation and investment in India, one of the largest and fastest-growing economies in the world,” says a statement released by Walmart. Is it a good move by Walmart? However, the big question is: Is the big American retailer right in paying up for a chance to make a big splash in India. According to estimates, the eCommerce market is expected to grow to US$ 200 billion by 2026 from US$ 38.5 billion as of 2017. The value of eCommerce market is expected to cross US$ 50 billion by 2018. A lot of growth of the industry has been pushed by the huge expansion of the Internet and smartphones. Moreover, India’s total internet user base is expected to increase up to 829 million by 2021 (59 per cent of total population), from 373 million (28 per cent of population) in 2016. “Walmart – Flipkart acquisition is a great move. FK touched the lives of just 5 percent of India’s population and still became so large. Imagine along with Walmart, what could be the future with 20 percent of population, that’s the whole of America. This is the success of so many people who predicted the future of retail right. Congrats to founders, team and most importantly early investors like Tiger who believed when most didn’t,” says Amit Chaudhary, COO, Lenskart. According to some industry experts, hopping on to the Flipkart bandwagon was probably Walmart’s best shot at making inroads into the Indian market. “I think all-in-all it was a good deal. Both the acquirer and the acquiree wanted what the other had. For Indian start-ups looking at an exit on a large valuation, this is a textbook case of an exit. For someone questioning foreign ownership of large Indian companies, my pointer to them is – in the interconnected world order – just like Indian owned companies will own crown jewels in overseas countries, foreign entities will also own big Indian companies. For those asking how Walmart benefits – remember this gives them an entry lock, stock, & barrel into the largest market in the world allowing foreign ownership. One of the most cost efficient companies in the world is re-entering one of the most value conscious countries in the world! Watch this space for the action!” says Kingshuk Hazra, Founder, LeadStrategus. Moreover, Flipkart has seen its revenues boom. In the latest fiscal year, Flipkart recorded growth of over 50 percent over the previous year. More importantly, it has withstood the challenge from Amazon and continues to be the leader in many segments. Walmart and Flipkart can consolidate their lead in this respect. According to reports, Flipkart founder Sachin Bansal will now exit completely. He has sold Walmart his entire 5.5% stake. Flipkart started in 2007 from Bengaluru.